Crochet for Baby All Year is a collection of 39 crochet patterns for baby/infant wearables with accessories by Tammy Hildebrand. In the introduction,Tammy shares that she was inspired to crochet great baby items after learning she was going to become a first-time grandmother in 2012. Although her grandbaby was a girl, Tammy aims for an equal opportunity book by sharing theme patterns for boys and girls organized around the calendar. The book is arranged in chapters by month. 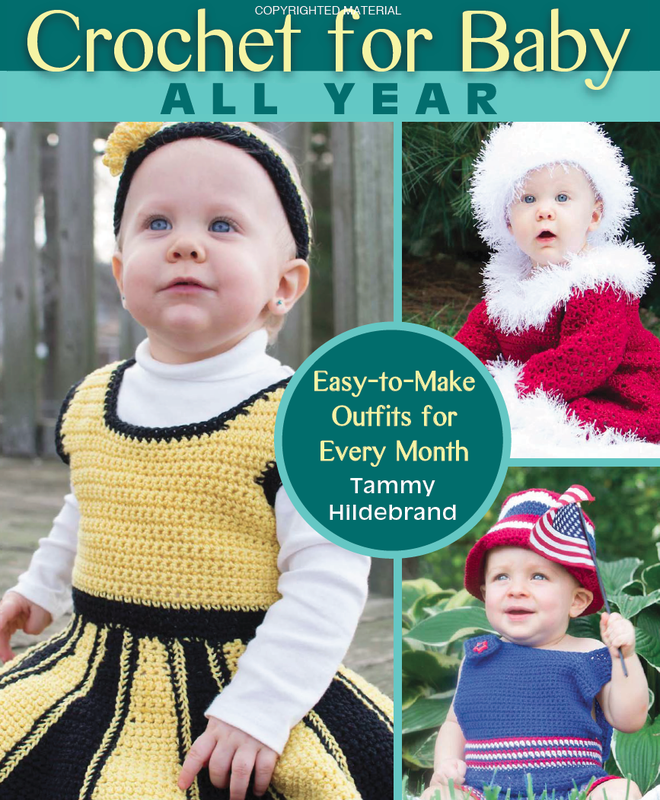 Each chapter opens with a large (nearly full page) photograph of an adorable infant boy or girl (or, frequently, both) wearing that month's outfits with accessories. Each month's patterns are either unisex or include variations for both boys and girls. Tammy describes the holiday or seasonal activity that inspired the outfit, and then the chapter continues with the patterns. Each pattern includes more photographs of the projects on the cute little models, the skill level, special stitches, and schematics when appropriate. Garments are generally available in 3-5 sizes from newborn through 18 months. Most of the patterns are considered easy, with one intermediate and one experienced pattern included in the book. The patterns are written with US crochet terminology. The book ends with a heartfelt acknowledgements page, information about the yarns used in the book, a glossary of pattern abbreviations, and thumbnails of each project for a quick visual reference. Like all pattern books, your enjoyment will be increased by the number of projects you actually want to make! (My personal favorites are the Stanley or Stella the Stegasaurus Costume; the Fall Festival Cardigan, Hat, and Booties set; and the Varsity Cheerleader Girl Dress and Headband.) You can see pictures of each project in Stackpole's lookbook here. There are no tutorials or stitch illustrations included, so this book is geared towards an advanced beginner or intermediate crocheter who has their basic skills down and is comfortable with reading US pattern abbreviations. I would recommend Crochet for Baby All Year to an advanced beginner crocheter who enjoys making projects for babies and infants and prefers reading pattern abbreviations. A more advanced crocheter might wish for more complex patterns, and a crocheter who prefers international stitch symbols won't find them in this book. The retail price for the paperback version is $21.95. Full disclosure: A free review copy of Crochet for Baby All Year was provided by Stackpole Books. Although I accept free products for review, I do not accept additional compensation, nor do I guarantee a positive review. My reviews are based entirely on my honest opinions. 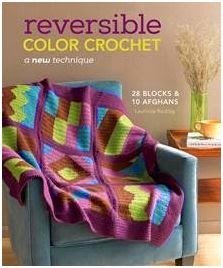 Today I have an interview with Laurinda Reddig on her brand new book Reversible Color Crochet! For those of you who haven't heard yet, Laurinda has come up with a very cool way to do reversible intarsia technique! Brenda: Who taught you to crochet? Laurinda: My Campfire Leader taught me to crochet when I was in junior high. Her house was halfway up the biggest hill on my nearly mile long walk home from the bus stop, so I stopped at her house nearly every day after school for a snack and often a craft. One day she was crocheting granny squares and I asked her to teach me. Because I am left-handed, she had me sit opposite her as she demonstrated how to work the stitches. I still have the Christmas tree skirt I eventually made from those first granny squares. Throughout high school and college, whenever I saw someone crocheting I would pick up new skills, including Tapestry/Colorwork at a church camp, Beading in the SCA (Society for Creative Anachronism), and Lacework while driving through a little town in Mexico. Brenda: Do you have a favorite fiber for working in intarsia? Laurinda: Not really. I actually like trying different types of yarn to get different effects. For the projects in the book I stuck with washable yarns, mostly superwash wool blends and acrylics. 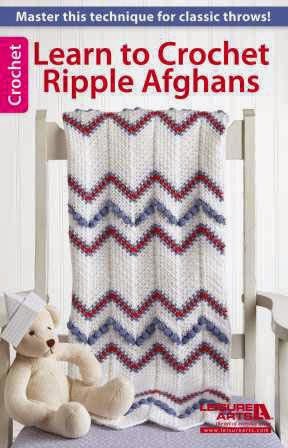 Who wants an afghan that will felt up if it accidentally gets thrown in warm water? Yarns that are not too tightly spun tend to fill in the spaces between stitches better to create a more solid colorwork fabric. But lately I have been playing with finer weight, even lace weight yarns but on a larger hook to create colorwork patterns with a lacy look. Brenda: What project would you suggest for a beginner? Laurinda: The Learn To Crochet Sampler (on the cover) was designed to basically teach the entire technique, building skills as you progress through the squares, including half double and double crochet stitches. It is helpful if crocheters have a basic understanding of how to join a new color in crochet, but that is also included in the first couple of squares. Also, you can make all of the "picture" squares by just learning the half double crochet stitches (which are a little easier than the double crochets). Each group of Picture Squares appears in order from easiest to most difficult, so either Grampa Kit’s Garden or Tyler’s Space Adventure would ease less experienced crocheters into working in this technique. Brenda: What hooks are your favorite for intarsia? Brenda: What is your favorite design in the book? Laurinda: Every time I show someone the book, I flip right to page 102, to show them my son’s pictures hanging on the wall behind Tyler’s Space Adventure blanket. Right below the Alien and Robot drawings on the wall, you can see my yarn version of his drawings. This was the last of the 10 blankets that I came up with, but has the best story. I designed the original version of this blanket, with the help of my son, for the son of a friend of mine. When he had to have brain surgery the week before Christmas (for the second time in as many months), I thought it would be nice to use intarsia to make squares of some of his favorite things, and enlisted the help of six other moms to make the solid squares (in his favorite color) that were stitched between the picture squares. Between my son’s drawings and the other crocheters it turned out to be a great community project to support a little boy we all knew and wanted to bring comfort. Head on over to Interweave to order your copy today! Giveaway! Celebrating 50,000 Facebook Friends! And the great news is that this contest is open worldwide, not just to our USA friends! How fantastic is that? But wait...there's more! 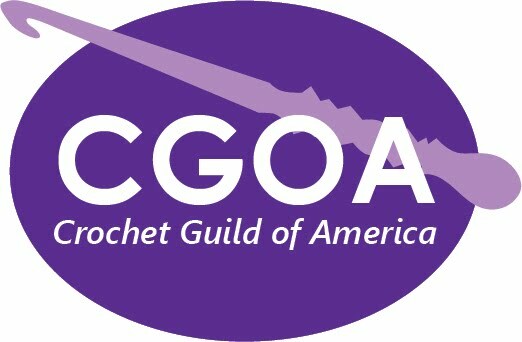 One lucky, grand prize winner will receive a one year membership to the Crochet Guild of America! If you're not yet a member of CGOA, you are going to want to pop over to our site and read about all the reasons why you should join right away! Here is a little sample of the top 25 reasons to join. Also, if you're in the Manchester, NH area or you can make arrangements to get there next week, join us for our 20th anniversary celebration of the Knit & Crochet Show. We would love to meet all of you! To enter, simply leave a comment on this post telling us your favorite thing to crochet! Good luck everyone! Rustic Modern Crochet features 18 designs inspired by the beauty of nature. Yumiko Alexander takes the splendor she sees in natural surroundings and landscapes and transforms that beauty into modern crochet design. Whether it be sand or sea, every design in the book will remind you of Mother Nature and the endless beauty she encompasses. Each one of the 18 patterns featured in Rustic Modern Crochet can be dressed up or down depending on what you pair with the finished piece. Each design combines different stitch patterns to create interesting visual appeal. The silhouettes of the designs are kept simple to showcase the stitches used in the overall design. The sophisticated rustic look of these designs can be achieved by any beginner but certainly will not look like they were stitched by a novice. Crocheters will feel proud of the garments they make using these upscale, urban designs. I especially love the look of the Sea Flower, a wrap that is edged in visually appealing lacy flowers and Driftwood, a wrap that uses chains and fan lace to give an amazing drape to the finished piece. All the designs in this book would be a great addition to any wardrobe. Rustic Modern Crochet is well-organized and easy to follow. No detail is left out. With the introduction of the book, Yumiko describes how she began designing crochet and her inspiration for each design. At the beginning of each pattern, you find the finished sizes, materials used, and gauge. There are notes that will help you create each piece, special instructions and stitches, as well as stitch diagrams to help you visualize the finished product. The glossary at the end of the book contains symbol key, sources for yarn used in the featured designs, abbreviations and an index of the patterns. Modern Rustic Crochet is published by Interweave Crochet, January 2014. 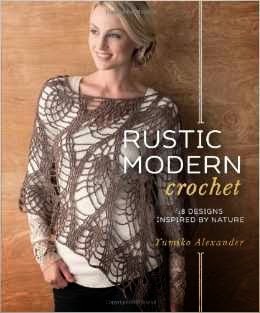 Full disclosure: A free review copy of Rustic Modern Crochet was provided by Interweave Press LLC. Although I accept free products for review, I do not accept additional compensation, nor do I guarantee a positive review. My reviews are based entirely on my honest opinions. First, let me tell you that this is not a crochet pattern book. 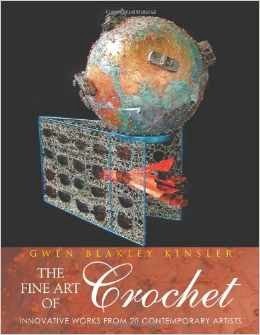 The Fine Art of Crochet by Gwen Blakley Kinsler is yummy, delicious, drool-worthy eye candy for all crocheters! This is more of a “these people are amazing” coffee table book for crochet lovers. It is an “oh-my-goodness, I didn't know you could make something like that out of crochet” type of book. Finally, it is definitely a “crochet actually IS art” book! Take it from me, someone who's crochet endeavors started as a hobby. This book will really challenge what you may have always thought of crochet. Even when I became a professional designer, I never considered what I did an “art form.” I consider myself a talented crafter, similar to an amazing woodworker. But the people that Gwen interviews and writes about in this book are more than your average crocheters. These people really are artists. Their work is jaw-dropping amazing! The author starts the book with a great introduction and a few brief chapters on the history of art crochet. She then moves on to introducing you to 20 different talented artists who's work all revolves around crochet in one way or another. I'm sure you will love learning about these awe-inspiring people. I was surprised at how many of these artists' work is displayed at major art museums around the word. A few of the impressive pieces really made an impact on me. I was stunned at Pate Conaway's hand-crocheted Garden Hoses. And when I say “hand crocheted,” I mean that he made all the individual stitches with his hands! No hooks were involved! I was also moved by a piece called “Image and Reality” by Karen Searle. Ms Searle's piece consists of a 14 inch tall, three dimensional, crocheted copper wire form of a normal woman's body, but inside this transparent piece is a bead covered Barbie doll. It really makes you think about how women view their own bodies. If you want to view crochet as something other than granny square vests, this book is for you. Ms. Kinsler says it herself, “With this book, my hope is to not only showcase their [the artists'] exotic, fantastic, and unique works of art, but also to illustrate how far crochet has come from the old fashioned trite hobby it was once considered.” You have succeeded very well Ms. Kinsler! My eyes have been opened and my thoughts changed on how I view crochet...forever. Full disclosure: A free review copy of The Fine Art of Crochet was provided by Author House. Although I accept free products for review, I do not accept additional compensation, nor do I guarantee a positive review. My reviews are based entirely on my honest opinions. I was in need of a quick gift and found Thread Bookmarks by Wanda Stevens. I love crocheting these delicate items because they make quick, yet meaningful gifts. Ms. Stevens gives you the patterns for 10 different bookmarks using size 10 crochet thread. Some designs even add ribbon accents. If you like to make small thread projects like I do, then this book would be a great addition to your library. My favorite design is Beautiful Butterfly Bookmark. It features a unique motif folded in half to create an exquisite butterfly. The bookmark is then accented with ribbons and a small button. Another design that I love is Pressed Flowers which is made from six circular motifs. Which one did I make? For my gift, I ended up making Birdhouse Border in shades of purple and pastel green. It was gorgeous and my mother loved it. This book also includes two different cross designs that would look amazing in anyone's Bible. One thing I really love about Thread Bookmarks is that each design also includes a chart. As usual, the book also contains a General Instructions section with information such as abbreviations and symbols, steel hook sizes, and gauge. I also like that the book is a portable 5.5” by 8.5” size. 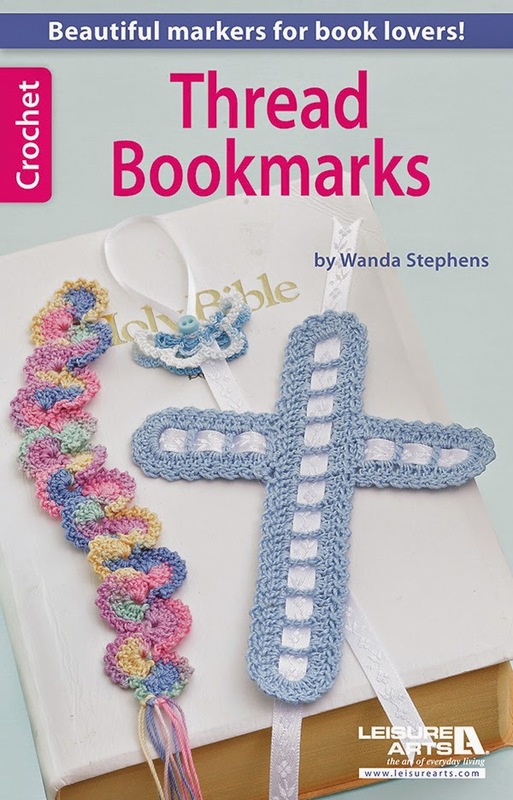 Thread Bookmarks by Wanda Stevens is an excellent resource if you enjoy reading, crocheting with thread, and making quick crocheted gifts. Full disclosure: A free review copy of Thread Bookmarks was provided by Leisure Arts. Although I accept free products for review, I do not accept additional compensation, nor do I guarantee a positive review. My reviews are based entirely on my honest opinions. 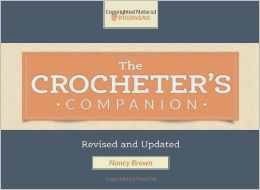 In this reprisal of a popular Interweave title, Brown makes the old standard Crocheter’s Companion even better, with even more information on tools, stitches and techniques, as well as expanded sections on Tunisian crochet and advanced crochet techniques like bead crochet, Aran crochet and Irish crochet. This reference would make a great gift for a new crochet friend or your local crochet teacher. The Crocheter’s Companion still comes in the handy spiral bound pocket size format to fit easily into your project bag, to make crochet on the go even better. Full disclosure: A free review copy of The Crocheter's Companion, Revised and Updated was provided by Interweave Press LLC. Although I accept free products for review, I do not accept additional compensation, nor do I guarantee a positive review. My reviews are based entirely on my honest opinions. Ahhhh, the ripple afghan; what stitcher doesn’t enjoy working this crochet standard? In this booklet from Leisure Arts, eight rippled lovelies tempt the ripple crochet afficianado. But these are not all plain old run-of-the-mill ripples; each design is unique in its own right, making this collection a satisfying variety of throws. From the closely stitched “American Sailor”, (no toes going through this blanket!) to the lacy “Malibu Ripple”, there are enough designs to please any stitcher. My personal favorite is the “Budding Beauty”, which features cute little flowers that are cleverly crocheted into the row as you go. There is one project in size 6 yarn, three in size 3 and the balance are worked in size 4 yarn. The best thing about working a ripple is that the repeats are typically easy to memorize and the results are always stunning, and this booklet provides the ripple crocheter with eight great choices. Full disclosure: A free review copy of Learn to Crochet Ripple Afghans was provided by Leisure Arts. Although I accept free products for review, I do not accept additional compensation, nor do I guarantee a positive review. My reviews are based entirely on my honest opinions. Have you ever attempted to crochet a project from a chart and found it difficult? Have you coveted the Japanese stitch dictionaries that have become so popular, but didn’t feel that you could interpret them? 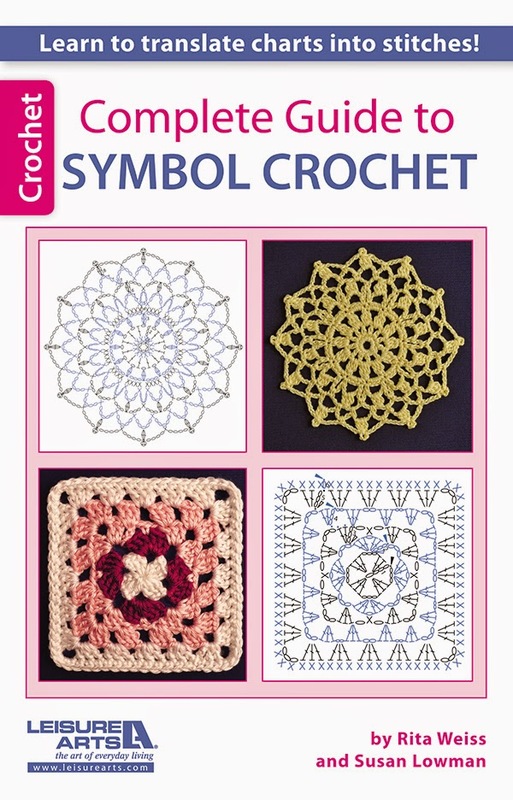 Weiss and Lowman break down how to successfully work from symbol crochet charts. Each stitch symbol is well-defined and line drawings take the reader through the formation of each stitch, making this not only a good guide for the experienced crocheter wanting to learn symbol crochet, but also a great reference for new stitchers who are looking to expand their stitch repertoire. Forty-seven symbols are represented and explained; but Weiss and Lowman don’t stop there. In the back of the book are nine small projects, designed for the stitcher to grow his or her skills as they learn to work from symbol crochet, including a hat, snowflake earrings, a scarf and several small home décor items. For those making the transition from written instructions to symbol crochet, both sets of instruction are provided side by side for ease of translation. By the time you work through the projects, you will be an expert at crocheting from symbols! The booklet is digest-size, which is perfect to keep in your work bag in the future, should you happen to need a little help when you see a symbol in which you're unfamiliar. Grab your own copy of the Complete Guide to Symbol Crochet and set your stitching free! Full disclosure: A free review copy of Complete Guide to Symbol Crochet was provided by Leisure Arts. Although I accept free products for review, I do not accept additional compensation, nor do I guarantee a positive review. My reviews are based entirely on my honest opinions.